The ancient temple of Mangaldev is situated on a small hill by the banks of the River Shipra (Kshipra) in Ujjain. Mangalnath is regarded as the birth place of Mars, according to the Matsya Purana. In ancient times, it was famous for a clear view of the planet and hence suitable for astronomical studies. 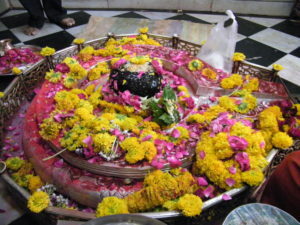 Mahadev or Shiva is the deity which is worshipped in the temple of Mangalnath. This is a preferred place for puja for Mangalik Dosha or Mangal Dosha. It is said that while fighting Andhakasur, Lord Shiva got tired and drops of his sweat fell on earth, dividing the earth into two parts. Lord Mangal came out from the womb of the Earth. Mangal started absorbing every drop of blood of Andhkasura, thus, preventing him from getting reborn. Ujjain holds an important place in the advanced ancient Indian science of Astronomy. Ujjain is situated on the tropic of cancer, and is effectively the ‘Greenwich Mean Time’of India for Panchang since many centuries. Ujjain has been an importance seat of learning. Location: Ujjain, Madhya Pradesh. About 5.5 km from the main Mahaleshwar Jyotirlinga Temple in Ujjain.